The arrival of Kerry Packer’s World Series Cricket in the spring of 1977 sent shockwaves through the world of cricket, and nowhere more so than in Australia; it soon became apparent that the tycoon had signed up almost all of the current first-choice Test XI. Greg Chappell, Dennis Lillee, Rod Marsh and David Hookes were perhaps the biggest names to have signed but no fewer than 13 of the 17 players named to tour England that summer were affiliated to WSC. Sensibly, all those concerned were allowed to complete the tour, while England also picked their Packer players (although Tony Greig’s continued selection didn’t meet with universal approval) but clearly, there would be major changes to the team that home summer, and also the need for a new captain. Of those who captained their states in 1976-77, Chappell, Marsh, Doug Walters and Richie Robinson had already taken the Packer dollar, while stand-ins such as John Maclean, Bob Blewett and Ian Brayshaw were untried at Test level. There seemed no obvious candidate to take over from Chappell – the young batsmen left to choose from, such as Kim Hughes and Gary Cosier, seemed unready for the responsibilty. Western Australia’s John Inverarity was a name much discussed, and at 33 was entering the veteran stage; but he’d met with little success in his six Tests, the last of which had been in England back in 1972, and it hardly helped that he’d missed the whole of the 1976-77 season. Eventually the task of leading Australia in her hour of crisis went to a man who’d been out of first-class cricket for a full ten years. Robert Baddeley Simpson, born in Sydney in February 1936 (eight days older than his old opening partner Bill Lawry) answered the call. Simpson had been a precocious talent in his youth, playing first grade at 15 for Petersham-Marrickville, and at 41 was still a prolific scorer in Sydney grade cricket; he’d just broken the Western Suburbs scoring record for a season. In between his career, like Steve Waugh’s was a classic case of rewarding the selectors’ patience. 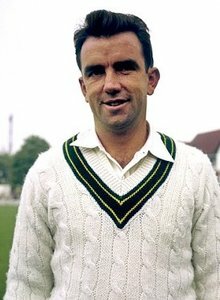 He’d performed well enough in five series since his debut in 1957-58, but when he went out to open with Lawry at Old Trafford in 1964 he’d played 29 Tests and 51 innings without reaching three figures. That gap in his CV was nailed with an innings of 311, which extended into the third day – to this day, only the Don has made a bigger score for Australia in England – and, the floodgates opened, he completed another nine tons in 22 matches before calling time in January 1968, just before turning 32, to pursue a business career. But Simpson couldn’t stay away from cricket; he toured England in each of the next two seasons with Cavaliers teams and also turned up in the unlikely setting of Chesterfield, playing for an ‘All Stars’ XI against Derbyshire in 1973. All this activity suggested someone whose retirement had been, to say the least, reluctant, and having got the all-clear from wife Meg and his two teenage daughters, he accepted the captaincy of Australia and New South Wales for the 1977-78 season. Simpson’s comeback match, for New South Wales against Western Australia at Perth, wasn’t a marked success – batting at five, he managed only 14 and five, falling to Sam Gannon and Tony Mann, two bowlers he’d later throw the ball to in the coming series against India. But he picked up three wickets – and at least his mooted rival Inverarity did no better, making 22 and one. A week later he was in action again at Adelaide and this time made 66 in a nine-wicket win, sharing in a hundred partnership with Peter Toohey, another soon-to-be Test team-mate. He must have felt in reasonable nick going into the Test series. The Indians would, prior to the shock news of WSC, not have been particularly optimistic about their chances in Australia that season. This was only their third full tour there, and they had yet to win a Test whereas the home side had won eight out of nine. Their batsmen were considered fallible against pace, and a first-choice attack of Lillee, Jeff Thomson and Len Pascoe would have certainly caused them problems. Suddenly, though, the playing field was levelled somewhat – only Thomson, who had not signed for World Series because of contractual difficulties, would be facing them. In fact the team announced for the opening Test at Brisbane contained, of necessity, no fewer than nine changes from that which had played at the Oval in August – only Thomson and batsman Craig Serjeant being retained from that eleven. I had a personal interest in the Test series that followed: thanks to excellent, illustrated match reports in the Cricketer magazine, to which I’d subscribed that year (far better than anything they come up with nowadays) it was the first series not involving England that I followed closely. I remember many of the details, such as night-watchman Mann’s hundred, to this day. It helped that the series itself was an absolute cracker – thanks to Packer, the sides were perfectly matched. Australia won the first two contests but India then came back into the picture by winning the third and fourth, leaving a rubber placed at 2-2 going into the final match for the fourth time in Australia’s history. On the first occasion, back in 1885, Shrewsbury’s England XI had won by an innings; on the second, ten years later, Australia had again lost the final match; but on the third Bradman’s men triumphed over Gubby Allen’s, and so it was here, Australia winning the final Test at Adelaide by 47 runs after a gallant effort by India to make 493. About Simpson’s own contribution there could be no argument; he made 539 runs with two centuries, 176 at Perth and an even 100 in the decider at Adelaide. If he might have hoped to capture more than four wickets with his leg-spin, the specialist, Mann did no better. And anyone who thought he accepted the invitation to captain knowing there’d be no serious pace to face from the Indians – their quickest bowlers were the medium-fast Madan Lal and Ghavri, with the 18-year-old Kapil Dev still awaiting his chance – needed only to be reminded of the second half of the season, a tour to the Caribbean. Australia had beaten the West Indies 5-1 at home on their previous meeting and Clive Lloyd’s men were impatiently waiting for their revenge. It’s been a few years since I’ve been able to say there was a current England player older than me – Mike Watkinson, by my calculation – but all of us ‘oldies’ feel our hearts gladden when a senior does unexpectedly well, and Bob Simpson’s contribution at a time of crisis should not be forgotten. Coincidence possibly (I wrote it to time with a new Australia – India series), but it wouldn’t be the first time Cricinfo have borrowed ideas from this site. I thought Thomson was the vice-captain for the India series, perhaps to ensure future loyalty, but the article states it was Craig Serjeant.The WA batsman was one who retired very young, as I recall.